TOKYO: India and Japan on Monday decided to cooperate for the first time in the areas of Indian traditional medicinal systems such as Yoga and Ayurveda to provide holistic healthcare and wellness in both countries. The Memorandum of Cooperation(MoC) between India’s Ministry of AYUSH (Ayurveda, Yoga and Naturopathy, Unani, Siddha and Homoeopathy) and the Kanagawa Prefectural Government was signed during the ongoing Prime Minister Narendra Modi’s visit to Japan. The MOC will also complement another MoC to promote cooperation in the areas of National Health Protection Mission. “The MoC will complement another MoC concluded during the visit between Ministry of Health and Family Welfare of India and the Office of Healthcare policy of the Cabinet Office of Japan & Japan’s Ministry of Health. It aims to promote cooperation in the areas identified under the National Health Protection Mission, such as primary health care, prevention of non-communicable diseases, sanitation, hygiene, nutrition and elderly care,” said a statement from the Ministry of External Affairs. 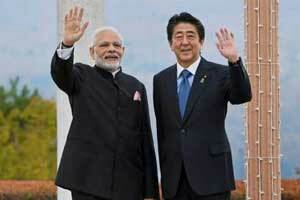 Modi is in Japan to attend the 13th India-Japan annual summit. During the Governor of Kanagawa, Mr Yuji Kutoiwa’s call on PM, the two sides discussed the potential to integrate Japan’s Artificial intelligence technologies and innovation with India’s healthcare initiatives, the statement said. Bharat Nippon- samurai sword fight, martial arts , learning of sanskrit & Janpnise language should be encouraged . Even the matrimonial services can integrate between the two nations. Similarly indian should have better ties with ISREAL , KURDISH , YEZDI, BAHAHI, ZOURASTRAINS . WE SHOULD HELP THE COMMUNITIES WHICH ARE AT DIFFICULT SITUATIONS.